it is, i believe, necessary to congratulate the guardian newspaper for its occasional variance from the strictures of reviewing motor cars on a weekly basis. every saturday, in the weekend magazine, only a few pages from the back, a journalist has a tendency to deconstruct a popular motor vehicle in the space of a few pithy and often humorous paragraphs. while i have no great love of the motor vehicle per se, i generally find these features quite entertaining. the reasoning behind my congratulations, however, is not for their publishing of something that appears in many other publications, but for the occasional interruption of same. and those congratulatory plaudits are due because the interruptions are usually provided by the paper's manchester editor, helen pidd, who every now and again, reviews a bicycle. sadly for those providing the occasional bicycle, her reviews have rarely been overly favourable, though often the bicycles under question are drawn from the lower end of the food chain. however, this past weekend, the value was suddenly raised quite considerably to a few pounds under £7,000. the cycle in question was sourced from london's cycle-fit and took the shape of a seven titanium road bike fitted with sram gearing that ms pidd found a tad awkward to use. however, the part of the review that will doubtless have raised the eyebrows of the regular motoring readers is the almost £7,000 price tag. you and i would scarcely pay heed to this factor (unless, of course, you were planning to purchase one), but considering there are motor cars on the market costing less, maybe the eyebrow raisers might have a point. and when you come to think of it, though a seven titanium bicycle would be an undoubted boon for the less athletic amongst us, you have to admit that your £7,000 does not seat more than one person, has no tangible luggage space and were the rider to experience a sudden outburst of precipitation, they'd get wet. that is, of course, unless the perceptive owner/rider has had the perspicacity to also afford themselves at the very least, a waterproof jacket, a fine and reputable example of which i just happen to have hanging on the back of the bedroom door. 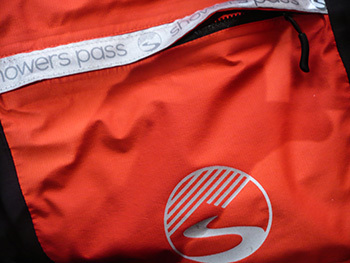 showers pass will be well known to most of you as the portland, oregon purveyors of waterproof outerwear. in the light of the amount of rain annually dumped on fair portland town and the number of folks taking to the bicycle in the pacific northwest, it's really of little suprise that someone had the foresight to commence waterproof production. and, based on previous items received for review with no notable exceptions, a remarkably fine job they've made of it too. 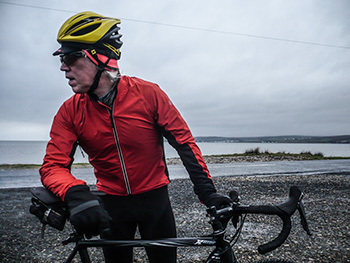 the latest, their spring classics jacket has the singular benefit of having been race developed at the highest level. 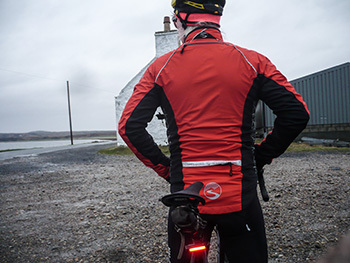 in 2014, the katusha team opted to use waterproof jackets sourced from showers pass. 2015 saw the team change clothing sponsor, one that featured its own waterproofs, so that connection is now no more. however, prior to the dissociation, it seems that the spring classics jacket was already well on its way to seeing the light of day. perhaps firstly, i ought to make mention of the sizing employed by portland's finest. i have considered myself from time immemorial to be a medium when considering jackets, jerseys and baselayers. so absorbed in my own sense of historical correctness have i been, that i have always ticked the medium box when requesting review samples. however, this time i paid close attention to the sizing chart on the showers pass website and realised that in fact, a small size might be more appropriate. it behoves me well to report that the received spring classics jacket fits perfectly. the fabric seems particularly reminsicent of that employed in showers pass' elite 2.0 hardshell jacket and is thus a smidgeon less flexible and stretchy than many of its competitors. that, however, seems to be totally ignored by the jacket, principally due to the waterproof softshell fabric used on the sides and inner section of the sleeves. i have worn it over a succession of sportwool type long-sleeve jerseys without restricting the flow of blood to my head, nor cutting off all respiratory functions. the full-length front zip takes a minor detour to the left as it reaches the high and fleecy lined collar, obviating any bunching at the neck. the cuffs on the sleeves provide a very close fit, one that didn't really allow for pulling on over a pair of thermal gloves. the latter have need of being worn after the jacket is on. here would have been the ideal opportunity for a pair of zipped cuffs. 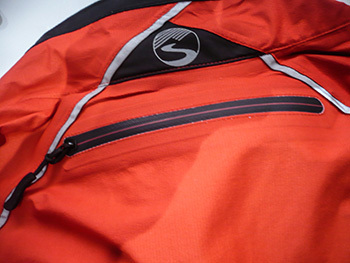 though the fabric is impressively breathable (i deliberately wore too much under its protection to give it a hard time), the opportunity to alleviate any predisposition to cook inside can be made by opening two zips with easily grabbed tags situated at the junction between the hardshell and softshell side panels. additionally, and still the only manufacturer i've seen implement this, there is a short zip neath the collar at the rear. it's a vent that proved suprisingly effective and without any apparent ingress of water. the existence of a single, zipped rear pocket is something of a dual-edged sword. while it is highly beneficial to feature a rear pocket on a stowaway jacket of any make, i'd really rather that the one pocket were three individual instances. however, it is possible to pack the entire jacket into its own pocket to take up as little space as possible, arguably justifying one with a zip. 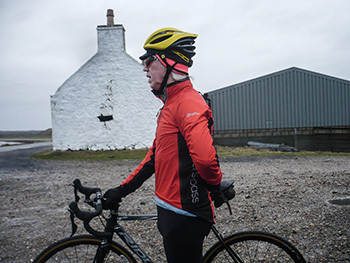 i harboured fears that the hardshell nature of the spring classics jacket would make it difficult if not impossible to cram it into a rear jersey pocket when not required, but i'm pleased to say i was totally wrong. in practice, the combinations of well-tailored sizing and an impressive dgeree of waterproofing provides lasting testament to the benefits of professional race development. as mentioned above, the breathability is particularly of note, while as a long-time owner and wearer of a showers pass elite 2.0 hardshell jacket, the ability of the classics jacket to allow pretty much every level of invasive precipitation to simply roll off was a joy to behold. 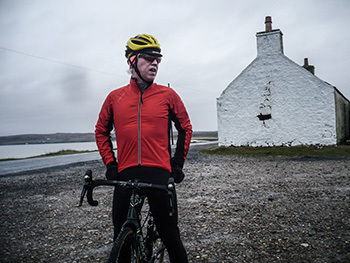 islay's weather currently shows no signs of improvement whatsoever, meaning more than gainful employment for this bright red waterproof for several months to come. the jacket is available in sizes ranging from xs to xl and also comes in black. the price of £199 puts it amongst the more pricey offerings from showers pass, but on the basis of several cold, wet and windy days between christmas and now, it seems very likely that your return on investment will be sooner rather than later.